Powder Perfect recently celebrated their fourth year of bringing us their amazing polish creations, and any celebration ultimately means treats! Treats for us in the form of sparkly new polish! 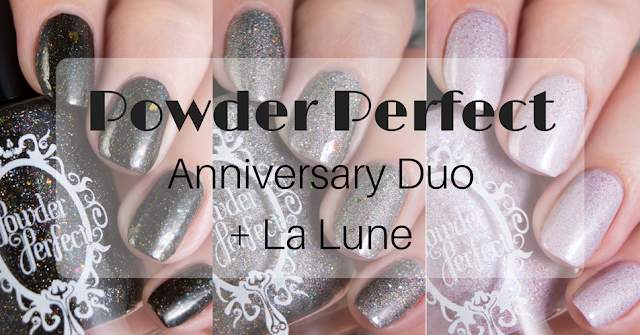 Today I'm showing off the stunning Anniversary Duo, and introducing the first polish from the La Lune Collection - a series of polishes inspired by the full moon. Let's get into it! Black jelly, filled with holo microglitter and a rainbow of multichrome flakes. The glitter and flakes give the finish a coppery warmth that makes me completely giddy. Black jelly and rainbow glitter has long been one of my favourite combinations and Cronosphere brings those elements together in a uniquely sophisticated way. The formula is up to the usual Powder Perfect standard - it's easy to apply and control, the flakes and glitters don't cause dragging or balding and the flakes lay perfectly flat on the nail. It's very well pigmented, though I used 3 coats to build up the rainbow of sparkle. I used the new Immortal Top Coat for my swatch. Glowing grey holo with blue holo microglitter and magenta-copper multichrome flakes. Each year one of the anniversary shades is inspired by wild weather which pleases me greatly as a fan of grey polish and a fan of stormy weather! I love the moody grey base and the out of control sparkle, but most of all I love the addition of the flakes! They're in all different sizes and they're sparse enough to offer a few odd pops of colour without taking over the finish. The formula, of course, fabulous. Beautifully pigmented and well crafted - it's thin enough to easily flow onto the nail, but viscous enough to keep all the glitter and flakes in line. 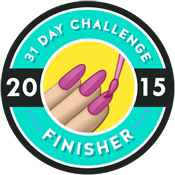 I did 3 thin coats for my swatch, a topped it with the new Immortal Top Coat. The La Lune Collection is a series of polishes to be released monthly, inspired by the full moon of that month. The first in the series is the namesake polish – La Lune is simply French for “The Moon”. Delicate greyed out rose holo with rose microglitters and delicate flecks of purple. The polish is intended to be 'reminiscent of the moon imbued with the colours of the sunset'. Gosh I love how Jacinta manages to create such stunning polishes and then describe them with straight up poetry! I am very excited to see how this collection develops over the coming months! Beautiful formula again, easy to apply with a surprisingly smooth finish for a polish with microglitters. 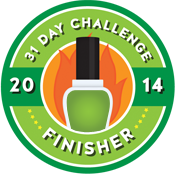 Three thin coats gave a perfect finish, and I finished it off with the new Immortal Top Coat. Both the Anniversary Duo and La Lune are available from Powder Perfect right now - the Anniversary Duo is extremely limited, with individually numbered bottles. Also available from today is the new Immortal Top Coat - "a smooth, glassy topcoat that is enhanced by curing under sunlight, or UV light. The UV rays enable the topcoat to bond to the base colour and sets the polish like flexible glass." The top coat is designed to work best with the Immortal Range (the Camelot Collection), but will work with any polish. I'm a night owl, so haven't had a chance to test the efficacy of curing the top coat in sunlight, however it still works brilliantly as a standard fast dry top coat - I'll have a full review for you soon!